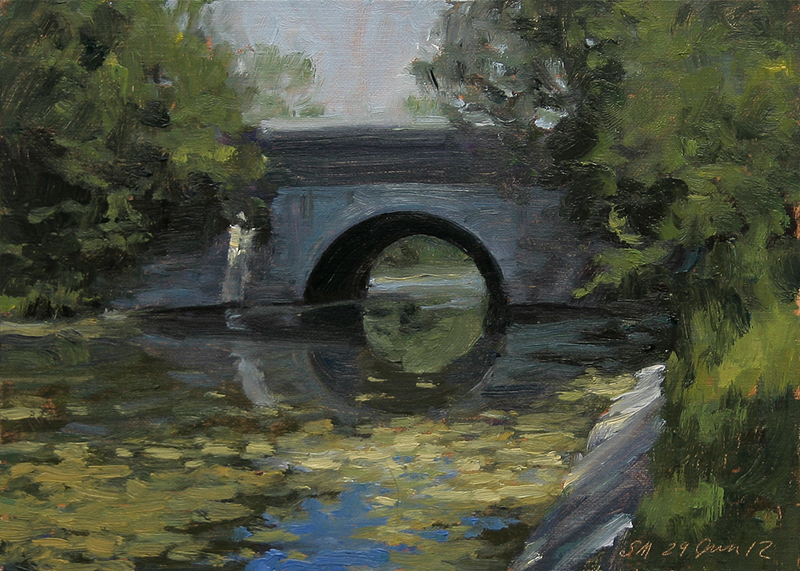 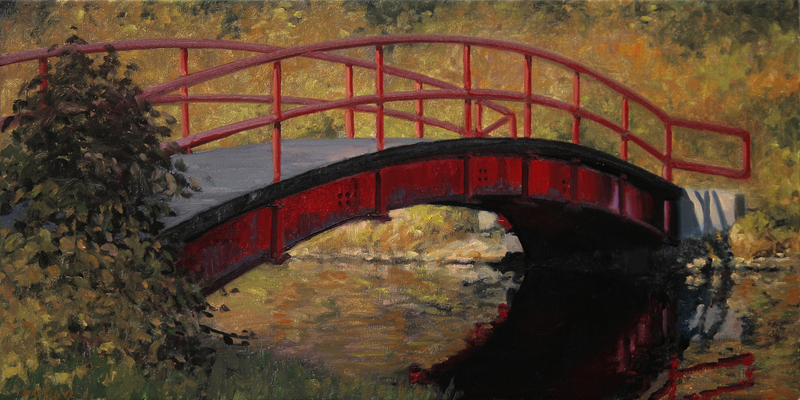 Oil on linen, 2012, 12x24""
This painting is a view of the red footbridge over Nashua Creek on Belle Isle Park.. 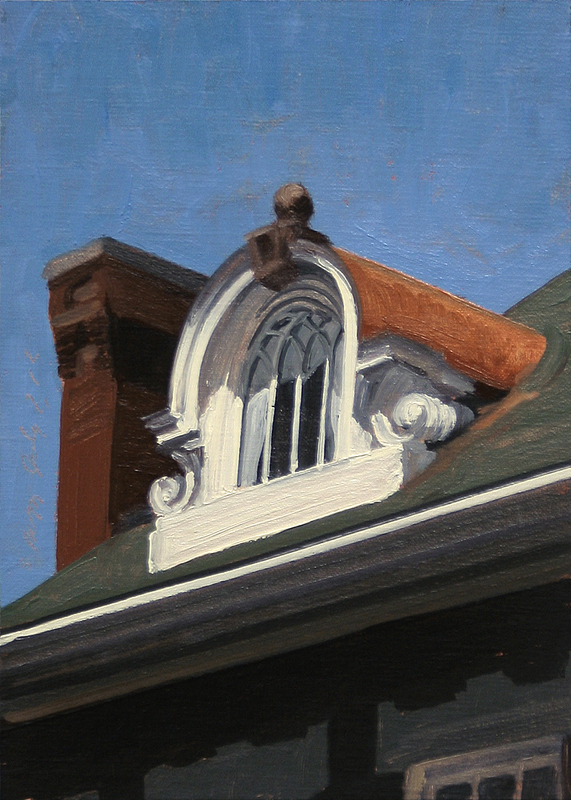 It will be in a show at The Art Gallery of the Macomb Center for the Performing Arts. 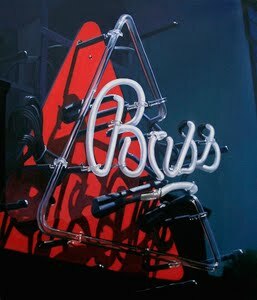 have been put on the back burner. 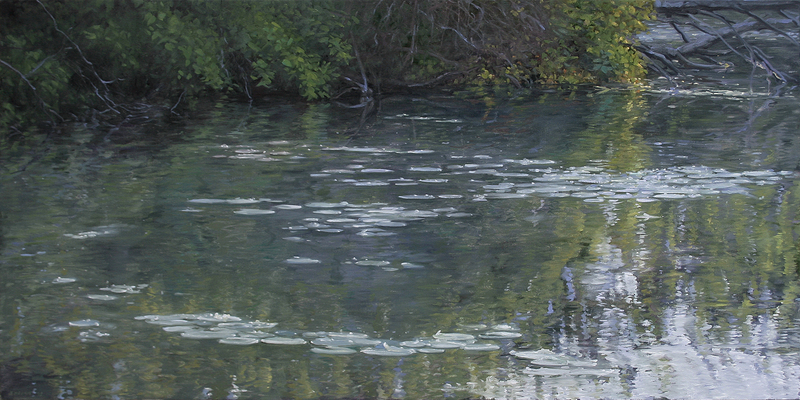 Oil on linen, 2012, 30x60"
This painting is a view of the shore line with reflections and water lilies on Belle Isle Park..
Oil on linen/panel, 2012, 12x9"
This painting is an urban landscape nocturne of an alley in Ferndale, MI. I was inspired by the great contrast of the warm light on the buildings against the deep indigo sky. 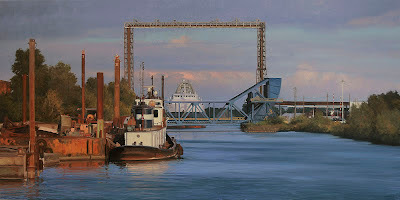 This painting is an industrial view of the RR Bridge to Zug Island, freighter Sarah Spencer, a tug boat and barges in the cut on the Rouge river in late evening light. 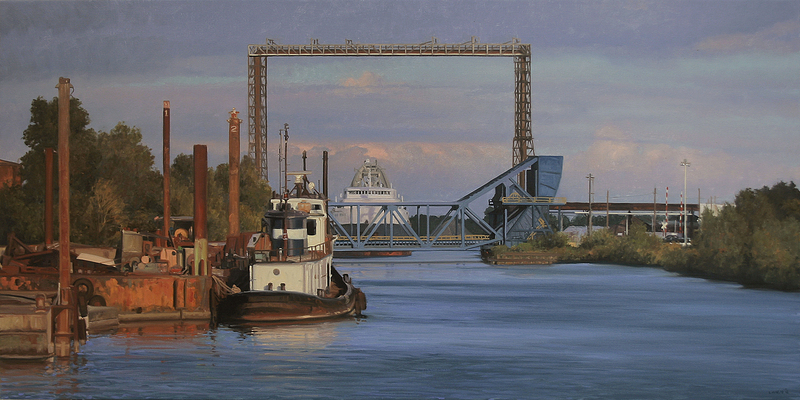 This Urban Landscape painting is a view of a beautiful arched dormer on an Edison St building at 2nd St.
Oil on linen, 2012, 20x56"
This painting is an industrial view of steel plants along the Detroit river. 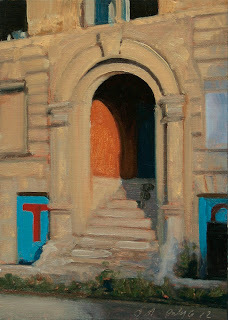 This Urban Landscape painting is a view of an arched doorway on a building on Watson St near Woodward Ave. 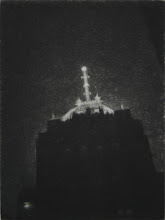 It looks like this one will be saved. There is a sign on it stating it is to be renovated, Detroit is undergoing a revival. It has taken a long time to start the turn around. 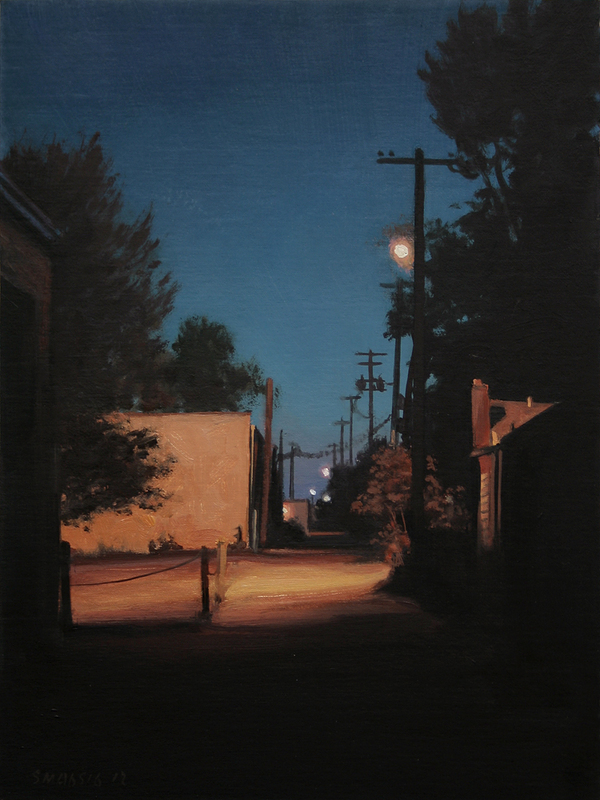 Oil on linen, 2012, 22x48"
This painting is an industrial view of the Hiram Walker & Sons Distillery in late evening light. This painting is a little looser for me, it doesn't look like it because it is reduced so much. But the brushwork is really quite painterly. 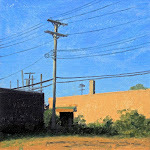 It will be in a two person show at The Art Gallery of the Macomb Center for the Performing Arts.